The small Native village of Saxman Alaska is 2.8 miles south of the tourist town of Ketchikan. Saxman is famous for its ancient Native American totem poles and has the largest collection of standing poles in the world. 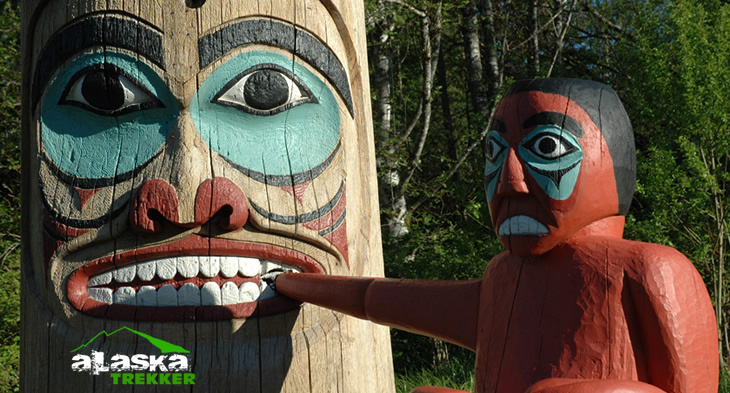 The totem park’s 29 poles carved by Tlingit and Haida natives each tell a different story. Some of the poles were moved here from The Old Cape Fox Lodge are over a 100 years old. At the Saxman Carving Shed you can actually watch carvers making totem poles. World famous Tlingit carver Nathan Jackson (the most famous totem pole carver in the world) works at the Saxman Carving Shed in Saxman. You can see him work there most days during the summer. Since they were first noticed by European explorers in the 1700s, totem poles may have been misunderstood. Britain’s Captain James Cook, who encountered totem poles off the coast of British Columbia, called them “truly monstrous figures.” Early missionaries thought the totem poles were worshiped as gods and encouraged them to be burned. And even today, when someone refers to the “low man on the totem pole,” they may not realize that the bottom figure was often the most important one – and usually, it wasn’t a man. See our Totem Pole page for a lot more information on totems. Saxman is a city on Revillagigedo Island in Ketchikan Gateway Borough in southeastern Alaska. Saxman was founded in the late 19th century when residents of the traditional Tlingit villages of Cape Fox and Tongass decided to consolidate their communities at a new build site on Revillagigedo Island, where they could share a new schoolhouse constructed through Federal appropriations. Saxman was named after a Presbyterian teacher, Samuel Saxman, who was lost in a canoe accident while seeking the new village build site. By 1894, the new village site was chosen, ideally located on a protected harbor off the Tongass Narrows. A small sawmill was built, and construction of the school and houses began immediately. Fishing and cutting lumber for the growing towns of Saxman and Ketchikan were the economic mainstays of the new village. By 1900, 142 people were living in Saxman. In 1929, the community incorporated as a city. During the 1930s, many totem poles and ceremonial artifacts, such as carvings and masks, were retrieved by the Civilian Conservation Corps from the abandoned villages at Cape Fox, Tongass, Cat Island, and Pennock Island. Totem poles were restored and relocated to Saxman as part of a U.S. Forest Service program. 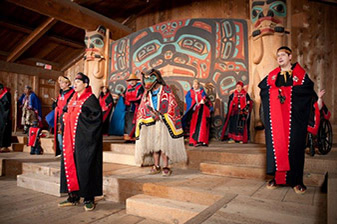 Visit Saxman Native Village and experience the rich living culture of southeast Alaska’s Native Americans. Get an exclusive look at the fascinating culture of SE Alaska’s original inhabitants. The Tlingits welcome guests in the traditional style that defines the culture of Southeast Alaska. A short video program introduces you to the culture and history of Saxman. You will then enter the Beaver Clan House where you are welcomed by song and dance by the Cape Fox Dance group. Visitors are encouraged to participate in the final dance, before moving on to the Saxman Totem Park, one of the largest gatherings of totems in the world. Your guide will help unravel the mysteries of these towering, majestic poles. At the Village Carving Center craftsmen pass on their skill to eager apprentices. Learn how modern day carvers differ from their ancestors and learn of their current projects around the world. Saxman also has an authentic clan house were you can watch the Saxman dancers. Saxman is located on the west side of Revillagigedo Island, 2 miles south of Ketchikan on the South Tongass Highway. It lies at approximately 55.318330 North Latitude and -131.595830 West Longitude. The area encompasses 1.0 sq. miles of land and 0.0 sq. miles of water. Saxman lies in the maritime climate zone noted for its warm winters, cool summers, and heavy precipitation. Average summer temperatures range from 46 to 59 °F; average winter temperatures range from 29 to 48 °F. The record high temperature is 97 °F; the record low is -4 °F. Precipitation averages 163 inches per year, with 69 inches of snow. *State of AK, DOT AMHS.